It seems lately that I’ve had a lot of luck on my thrift store hunts. I’m either finding huge scores, or nothing at all. 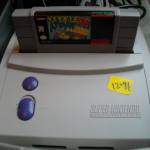 You might remember the $5 Atari Jaguar I got about a month ago, well today I’m going to present to you my Super Nintendo Jr. find! 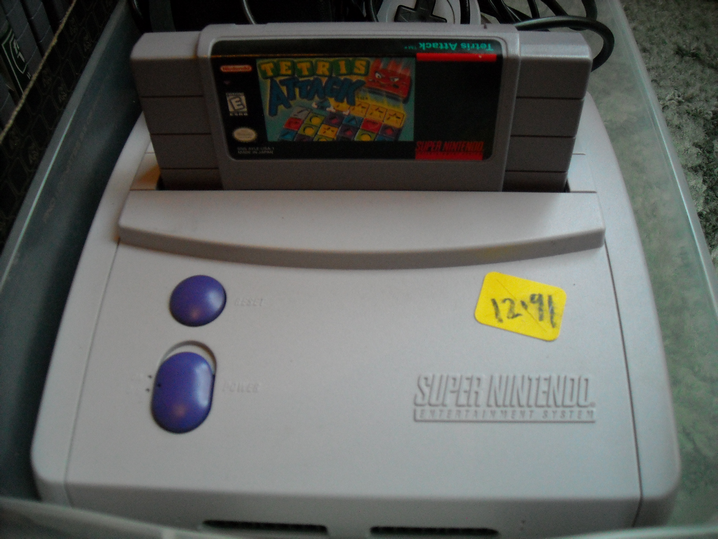 I’ve owned a normal Super Nintendo for about 12 years, but the poor thing rarely gets much love. I am a MASSIVE RPG fan and as we know the SNES’s library was rife with great RPGs, but that also means these games are either impossibly difficult to find or amazingly expensive! That isn’t to say my SNES game collection is small, I just haven’t been focusing as much time on it as I have my regular NES collection. When I do find SNES games they’re generally sports titles, although I did score Batman Returns at a flea market a few weeks ago, which will be part of it’s own article later. 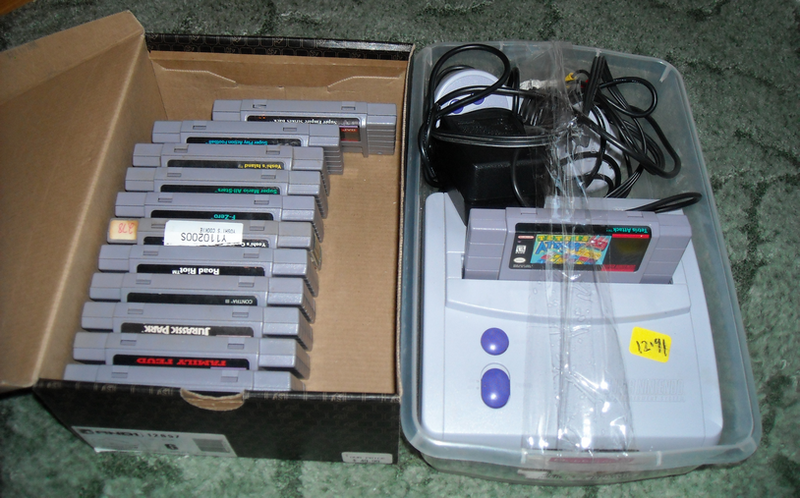 Needless to say my SNES collection exists, but it isn’t as great as I wish it could be. So every Tuesday my schedule is pretty much the same as I hit a handful of places and usually find little to nothing, but on some occasions I find great deals! 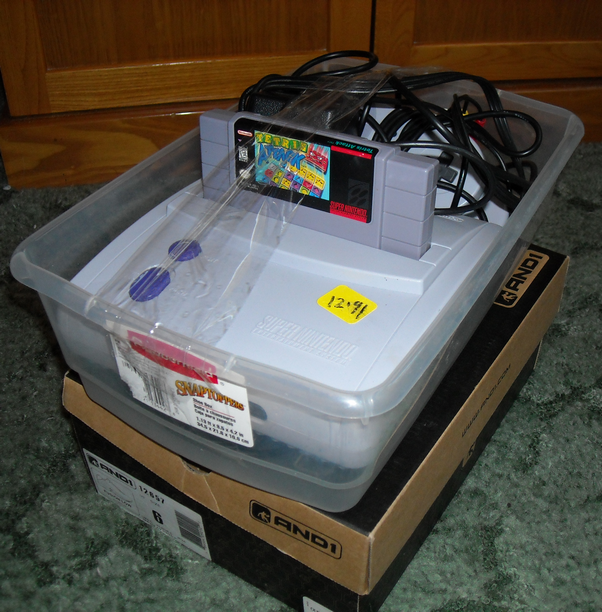 The store where I found the SNES Jr is pretty hit or miss with what they have, but that day I walked along the electronics wall and saw it sitting in a clear plastic tub with 2 controllers, the power supply and the AV cable. When I went to pick the tub up, I noticed it was all taped to a shoe box underneath. I gave the box a shake and the unmistakable sound of SNES cartridges clanking around poured out of the box. I saw the price tag and I needed to make sure it was all one price, even though it was all taped together. I found the nearest employee, who almost started having a childhood flashback right there in the store, who told me that yes it was that price and that I should probably go test it on their TVs, which I promptly did! The system had Tetris Attack already plugged in and ready to go. After getting everything hooked up the system powered on and Tetris Attack started working perfectly! I didn’t even know what games were in the box until I got out of the store and gave them all a good once over. There was a total of 12 games, which I will be listing in the spoiler below, and sadly none of them were RPGs as I had highly hoped. Luckily most of the games that came with it are well worth the purchase, especially one in particular. 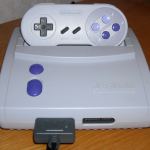 The controllers included are 2 SNES controller variants I had never seen before, the SNS102 (embedded Nintendo logo instead of printed) and a normal controller with a painted L and R on the shoulder buttons. 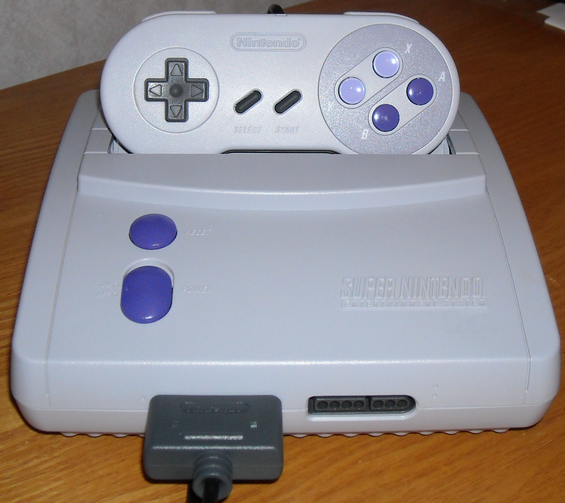 I’ve only seen the SNES Jr on two or three occasions at Disc Replay, and even though I think they ask about $55 for the system alone they never seem to stay in stock for too long. 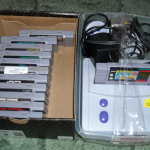 My main goal in hunting has been to snag an NES 2, but I’m still searching high and low. Hopefully soon I’ll be able to pair one with this system, it can only be a matter of time, eh? Thanks! But, this isn’t for sale. Maybe check online for one, they are pretty neat.